continues through Sun., July 27. 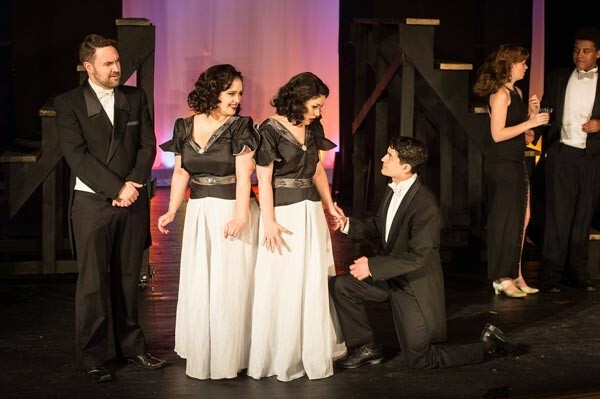 From left: Chad Elder, Cara Walkowiak, Kristin Welch and Andrew DeBonis in Stage 62's Side Show. The title of the lavish opening number says it all: "Come Look at the Freaks." Side Show is based on the real-life story of conjoined twins Daisy and Violet Hilton, who are arguably best remembered for their roles in the 1932 classic horror film Freaks. 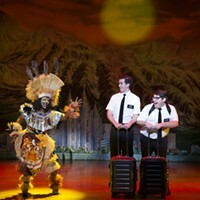 However, Bill Russell and Henry Krieger's musical, which debuted on Broadway in 1997, only alludes to the sisters' eventual careers in Hollywood, focusing instead on their rise from small-time carnival attraction to major vaudeville act. 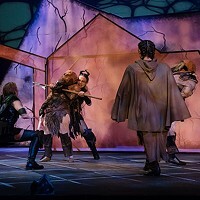 Rob James directs this ambitious Stage 62 production, which includes a 12-piece orchestra and more than two dozen songs. But the actresses portraying the Hilton sisters are the real draw. Kristin Welch imbues Violet with level-headed pathos, while Cara Walkowiak captures Daisy's indomitable ambition. When it comes to love, though, the two girls share taste in cads, falling for impresarios Buddy (Andrew DeBonis) and Terry (Chad Elder), who care less about the twins than about their own careers. The elaborate revue numbers of Side Show live up to their Broadway roots, but the somber duets, in which the girls contemplate their lives behind the scenes, feature a few too many maudlin lyrics and clunky metaphors: Under a less capable director, the "Tunnel of Love" interlude could have been cringe-inducing. Yet like the show-biz matrons they're playing, Walkowiak and Welch sell the songs with effortless style, as does the entire ensemble, from the sideshow boss to the four-woman harem. Korey White in particular shines as Jake (a.k.a. the Cannibal King), who harbors an unrequited love for Violet and the voice to belt out songs like "You Should Be Loved." Side Show's timeline for the supposedly true events is a bit sketchy: For example, it has film director Tod Browning first meeting the twins at the Texas Centennial Exposition in 1936 — four years after the real-life release of Freaks. But the heart of this show doesn't lie in historical accuracy. It's in the story of two outcasts learning to find their place in the world. That's a tale worth telling, and thanks to the superb players behind this production, this is a musical worth seeing.